Best clay resource in ASEAN and green material. High-tech production line imported from Italy, Germany, Japan. High skill and experienced work force. High quality product, various sizes and colors, and enviromently friendly. Exported to 40 countries GOM DAT VIET is the leading brand of terracotta in Vietnam. Our clay bricks and roofing tiles are manufactured by Dong Trieu Brick & Tile J.S.C while Cotto tiles are manufactured by Vietnamese Ceramic J.S.C. GOM DAT VIET products are made of well-known clay sources in Quang Ninh province, processed with modern production line, applied advanced technology from Europe and controlled by experienced technicians. 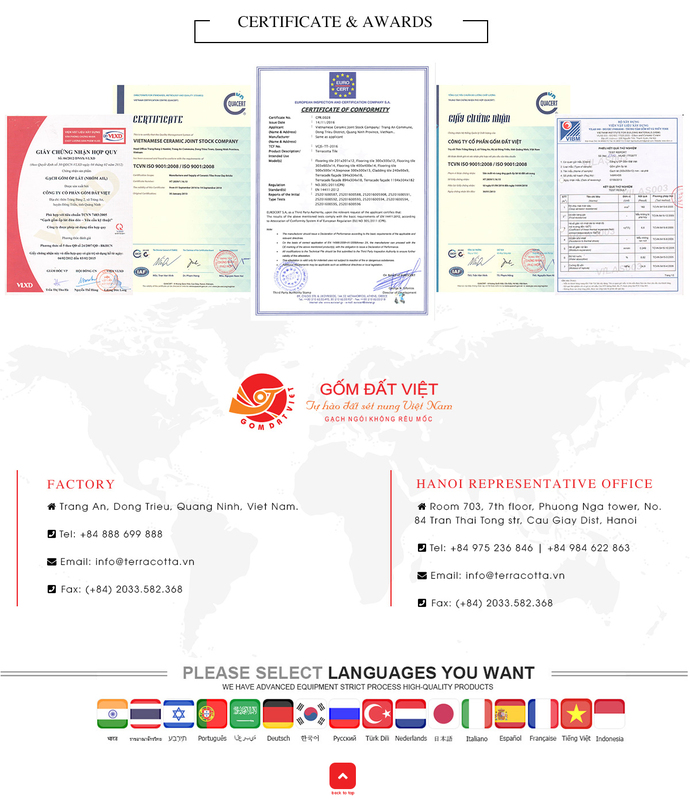 Widely distributed in 63 provinces, cities and exported to many regions such as: ASEAN, EU, Middle East, Australia, New Zealand, China, Japan, Korean..., GOM DAT VIET products are not only prestigious in the local market but also pleasant to use. Customers could easily select suitable products for their project and shall be satisfied when using GOM DAT VIET products. We are always pay high attention to high quality products and production stability to maintain the environment friendly. We also diversify models of invention in order to make your life most comfortable selecting products and to maximize the aesthetics in your piece of work. With motto "Clients' Satisfaction is our success" we always pursue innovation and creation to meet various customer needs, and we deeply believe that GOM DAT VIET will bring a luxuriously cosy home to everyone. Marketing-export department is established in the first days, together with company. This office is central of company, near factory and General Director's office. Our factory area is about 18000ha, with more than 1000 workers and the modern machine line imported from Italia, Germany, Holand. We export Terracotta tile products: Flooring Tiles, Cladding Tiles, Roofing Tiles, Step Nose. We are aiming to Africa, America, and Europe market.